If you’re wondering what to do for Valentine’s Day and are on a budget, we’ve come up with 10 out-of-the-box, fun and creative Valentine’s Day things to do with your significant other or date. If the idea of buying a box of chocolates and one dozen roses sounds so cliché to you, you’ll enjoy these activities, regardless of your relationship status. Let’s help you make it an evening, or weekend to remember. 1. Take a Dance Class. Dancing to tango music can be very romantic. Dress up for the occasion and find a class near you. If tango isn’t your style, try salsa or hip-hop as an alternative. It will get your body moving and can get you in the mood for a romantic and memorable evening. Even if you can’t find a class anywhere, take your Valentine dancing at a local spot with live music anyway! 2. Create a Digital Scavenger Hunt. We know you’re attached to your mobile phones and tablets (it’s okay, so are we), so create a little mystery with your very own personalized scavenger hunt. Not sure where to start? Begin the day with a “Happy Valentine’s Day” text and send the first clue. When she arrives at the destination, send her a second clue requesting a Skype or FaceTime chat where you can wish each other a Happy Valentine’s Day, video style. Third, send another text message on where you’d like her to go next. Have her pampered with a manicure or pedicure to get ready for your big date night, or even send her to a spa for a relaxing massage. Fourth, at the end of the day, post a lovey picture of the two of you on her Facebook page for her and her friends to ‘like.’ Finally, send her a digital invitation with the exact location for your Valentine’s date. Remember to take photos along the way and share them on all of your social media accounts so everyone can see how you celebrated with you love. 3. Go Ice Skating. Whether it’s ice-skating or roller-skating, take your Valentine to the closest rink in town. You’ll find yourselves reminiscing about your childhood memories, while you get a little physical activity. Remember to catch her if she falls! 4. Book His-and-Her Massages. Having warm oil massaged into your body is surely a treat. If your relationship hasn’t moved in that direction yet, book Swedish massages for the two of you in separate rooms, so you both can enjoy the experience and compare notes afterwards and say hello to relaxation. 5. Go Wine Tasting. Many local wine bars allow you to stop by and taste several options before deciding on your favorite selection. Take your date to a bar known for their wine tastings, where you both can get a wine card for samples and compare notes. At the end of the night, buy him or her their new favorite bottle for the two of you to share on another date night. 6. Enjoy In-Room Dining. If you’ve waited until the last minute and realize that your date’s favorite restaurant is already booked, no need to fret! Pretend you’re on vacation and opt for an in-room dining alternative. You can take care of the appetizers and main course, but ask your date for input on the dessert the menu. Create great ambiance with candles, music, rose petals, and perhaps a bouquet of red tulips, if roses aren’t in your budget. After that romantic dinner, there’s not need to get a room. You’re already there. 7. Make it About Music. There’s something uber romantic about sharing music with the one you love (or like). Plus, Shakespeare said, “If music be the food of love, play on.” Make your Valentine’s a night of music. Buy your Valentine a music CD or create a playlist, then stay in and watch a recorded concert on TV. Download a mobile app where you can name that tune and see who wins.Make a music playlist for him or her as a gift, then go out to hear some live music together. If your date’s favorite band might be playing in the near future, surprise them and pick up some tickets as a gift. Hello Coachella and Stagecoach! If the show is months away, watch some live concerts on TV together and download some music to listen to together, so you can get pumped for the concert. 8. Go to an Amusement Park. There’s something romantic about riding the Ferris wheel, especially when it stops and you’re feeling like you’re on top of the world. Remember to kiss your Valentine when you’re staring at the stars together. Then hold your date tight as you ride the roller coaster together. Show them you’re there to protect him or her. Snap some photos and post them on Instagram (with permission from your date). 9. Take a Cooking Class. Guys actually enjoy being creative in the kitchen. It helps with relaxation, so take him to a cooking class, where the two of you can whip up a fancy meal. Find a place to go for dessert together, with your menus in hand and order chocolate. It’s the ultimate aphrodisiac. 10. Go to a Fortune Teller or Psychic. He love me, he loves me not? Stop by a fortune teller or card reader with your Valentine to see what the future will hold. Don’t worry, you don’t need to kiss-and-tell after your turn. P.S. Take your profile down before Valentine’s Day. It’s a leap of good faith that will help you have a Happy Valentine’s Day. Julie Spira is America’s Top Online Dating Expert and Digital Matchmaker. She was an early adopter of the Internet and is the CEO of CyberDatingExpert.com. Julie and her team create Irresistible Profiles for singles on the dating scene. For more relationship advice, sign up for the free Weekly Flirt Newsletter and follow @Julie Spira on Instagram and Twitter. View our book trailer for The Perils of Cyber-Dating: Confessions of a Hopeful Romantic Looking for Love Online, NEWLY REVISED with a magical epilogue and Bonus Audio Dating Advice. 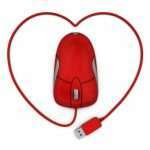 BBC Live Debate – Can You Find Love on the Internet? There’s no shortage of advice and opinions when it comes to matters of the heart on Valentine’s Day. In celebration of the most romantic day of the year, I’ll be returning to BBC Live 5, at midnight UK, 7pm EST, 4pm PST to talk about finding love online on Valentine’s Day. In this lively debate on the Tony Livesey show, I’ll be joined with British dating expert, Andy Jones and a woman who is dead set against joining an online dating site. I believe as Facebook continues to grown, so will memberships to online dating sites. Can we convince her to give it a shot? Are you for or against online dating? Here are my Top 10 Online Dating Dos and Don’ts for Valentine’s Day, and beyond. Hint: She won’t be flattered to receive a text message from a male suitor that says Happy Valentine’s Day, when he hasn’t asked her to be his Valentine. We’ll be answering your questions on the dos and don’ts of online dating on this special Valentine’s edition of the Tony Livesey show, so I hope you tune in to listen. Christmas was barely over when the stores turned their holiday red into holiday hearts in preparation for Valentine?s Day. As we?re a few weeks away from the day that women dream about every year and that some men purposely book business trips to avoid the pressure of the season, it?s time to take a look at the dos and don?ts for Valentine?s Day for every type of love stage. 1.???? Do make a dinner reservation for February 14th. Even if you don?t have a date in mind, go ahead and reserve a table on OpenTable.com. Many restaurants book up in January. You can always cancel the reservation if you find yourself dateless on the days leading up to Valentine?s. 2.???? Don?t ask her out for Valentine?s Day in an email or a text message. This is the time for you to either pick up the phone and call or better yet, ask her in person if your date is going well. 3.???? Do discuss Valentine?s Day with the person you are dating. If one of you loves the holiday and the other can?t bear it, come up with a compromise. Valentine?s is on a Monday this year. Pick a different night for a romantic dinner and make it a special date night on one of the days leading up to the 14th. 4.???? Don?t go overboard with flowers. It?s the thought that counts. Stop by your local grocery story and pick up one long stemmed rose. It has the same impact as the full dozen and is 1/12th the price. 5.???? Don?t wait until the week before to ask her to spend the Valentine?s with you. If you are dating someone special and you know for sure you?d like her to be your Valentine, ask her out at least two weeks in advance. 6.???? Do try in-room dining this year. Light some candles, cook up a simple meal in the kitchen together and look forward to a steamy dessert. 7.???? Don?t make gift giving too much pressure. You may still be paying your credit card bill from the holidays. A card, a hug, and some lingerie and massage oils will make a memorable evening. 8.???? Do accept invitations for Valentine?s dances and parties the weekend before February 14th. You won?t feel alone with so many other singles in a fun and flirty setting. Wear red for the occasion and say yes if someone asks you to be his or her Valentine. 9.???? Don?t be blue if you can?t be with your sweetheart on Valentine?s Day. Schedule a SKYPE date, wear red, and flirt the night away with your long distance love. 10.?? Do wake up and wish your loved one a Happy Valentine?s Day in a voicemail, email, or text message to let them know that you?re looking forward to spending the evening together. Do you look forward or dread Valentine?s Day? We?d like to hear your comments. It’s now 5 days before Valentine’s Day. The Super Bowl memories are starting to fade. Have you asked your date to be your Valentine yet? If not, are you aware that there is a “cut-off” rule for when to solidify who you will be spending February 14th with? If you have watched Curb Your Enthusiasm, you might recall that Larry discussed the cut-off rule in an episode. They determined 9:30-10:00pm for the cut-off time to phone a friend. It became a heated discussion. The same theory applies to Valentine’s Day. In my online dating book, The Perils of Cyber-Dating: Confessions of a Hopeful Romantic Looking for Love Online, one of my rules of netiquette was the cut-off rule. This rule applied to the most common misrepresentation in an online dating profile – the accuracy of your age . Although I believe in authenticity, I had decided that 5-10 years was the maximum amount of years that you could take off your age in your profile. I added that you need to be honest in the body of your email, on the phone, or certainly the latest by the first-date. I don’t promote lying on your profile, I just know that many singles want to fit into a search. So, getting back to Valentine’s Day. When is it too late to ask the woman you are dating out for Sunday night? ?Here’s my relationship advice. I took a poll during the Super Bowl and most men felt they could wait until the last day, if there was chemistry with someone they had just met. I disagreed. I told them, one week maximum, and that once the Super Bowl was over, it was time to put the date in ink on the calendar and get whatever remaining reservations were available at such a late date. Think about it. Most restaurants book up a month in advance of Valentine’s Day. There will be slim pickings. You can always bring food home and set the table with fine china and candles, but it won’t be the same. If you are waiting until the last minute, don’t be surprised to find your date has made other plans. A smart, confident woman doesn’t wait around for the phone to ring. She’d rather be alone than be an afterthought. ?If you have made Valentine’s plans and have a change of heart, don’t go down in history as the guy or girl who cancels on her Valentine’s date the week of because something better came along. It will come back to haunt you. If you are gearing up for this romantic day, logging into your online dating profile on a regular basis during the days leading to Valentine’s may get you in the “dog house.” It certainly won’t get you into the bedroom. With or without a date, my advice is to try and enjoy Valentine’s Day and be open to the possibilities of love. It may arrive on time, or it may be late. If you are really interested in pursuing someone romantically, don’t forget Valentine’s Day. If so, be prepared that your calls won’t be returned. It’s almost two weeks until Valentine’s Day. There’s no need to hide or ban wearing red until February 15th. Read my dating advice on JDate’s advice site, JMag for singles who would like to get lucky in love by Valentine’s Day.